The orchid is the national flower of Colombia. 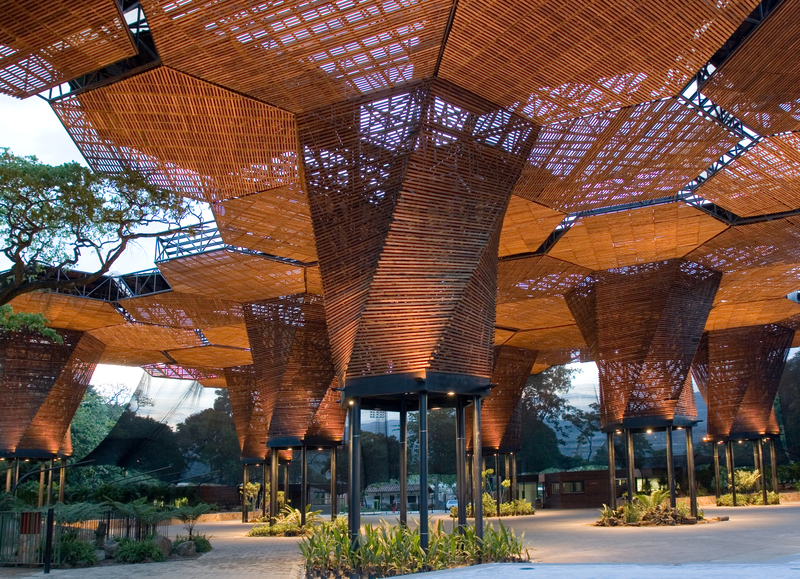 In the Botanical Gardens of Medellín, woven into the vegetation, is the Orquideorama, the result of an architectural ideas competition in 2005. 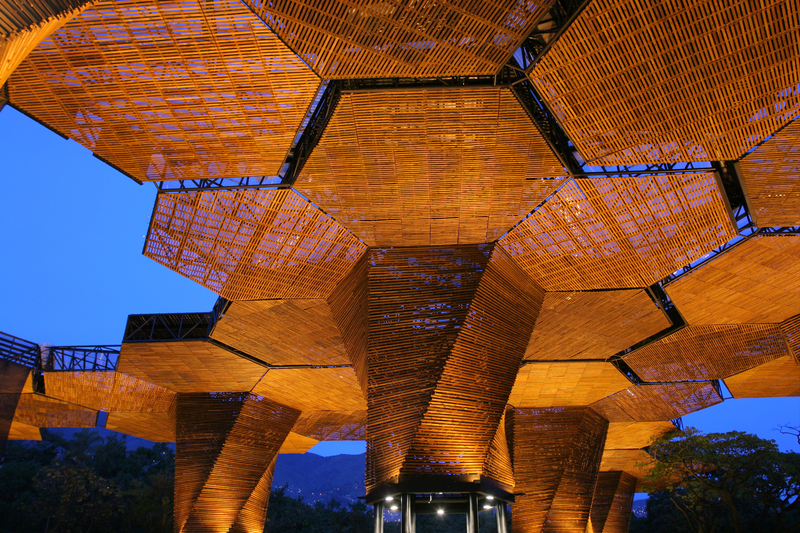 The winning design was a collaboration between Plan:b Arquitectura (Alejandro Bernal and Felipe Mesa) and JPRCR (J. Paul Restrepo y Camilo Restrepo). The jury were impressed by the projects reference to nature, abstraction and aesthetic clarity; an idea capable of becoming a symbol for the city of Medellin. The Orquideorama is a fantastically bold structure housing orchids and plant exhibitions as well as being the backdrop for hosting a variety of events such as concerts, weddings, parties, and fairs. 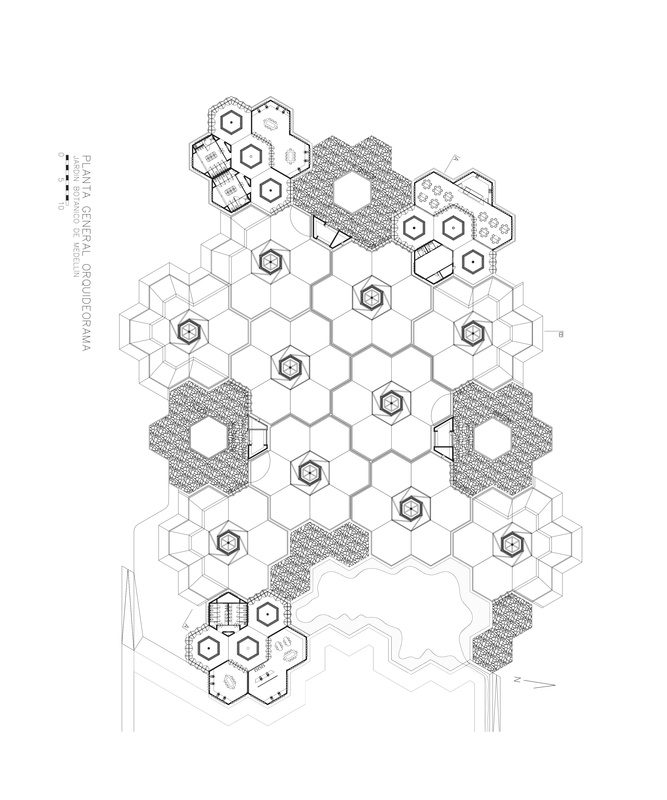 The hexagonal honeycomb structure, allows for growth and flexibility in the floor plan; a single module which can be systematically repeated. The architects refer to it as flower-tree, meaning a flower form figure with the scale and properties of a tree. It works with the scale of the surrounding trees and borrows from their strategies by concentrating all the service networks in the trunk, and opening up to create a translucent foliage canopy. The built structure assembles modules of seven hexagons, defining a spatial, structural and bioclimatic pattern. This pattern allows repetition, controlled growth and flexibility, in order to avoid touching the already existing trees and to adapt to a limited budget. 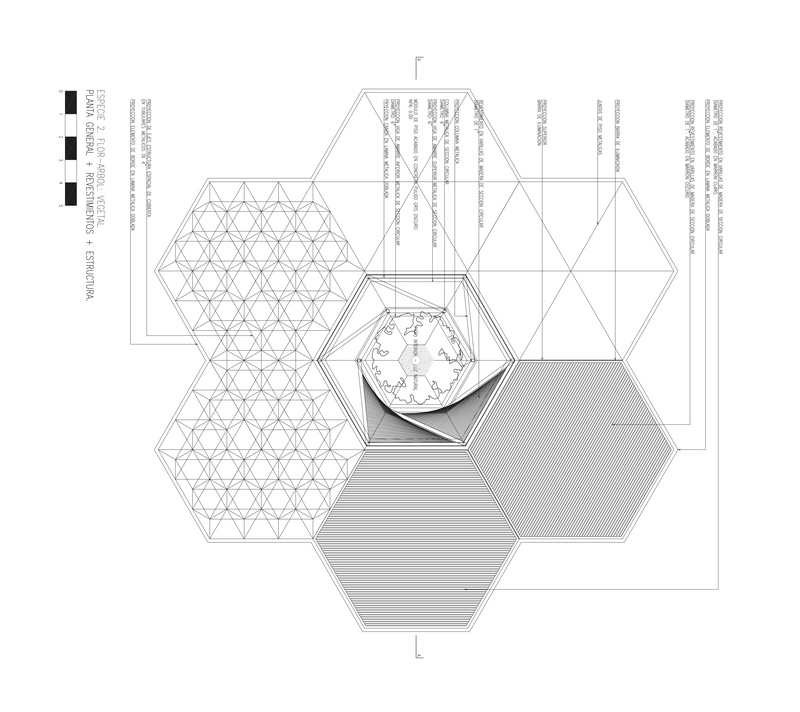 This module has a central hexagon, like a hollow trunk, in which the technical network (structural, electrical, and water collection), the organic network, a hot air exit, and an access to rain and humidity for the internal gardens, concentrate. The modules can exist independently, but their “intelligence” amplifies through repetition. The proposal was to build the Orchideorama in the way one sows flowers: “One flower-tree grows, and just beside it, another will appear, until the complete system of flower-tree structures are defined. They can grow or be sown where possible, adapting its system structure to the field where it is intended or needed.” As such, the system can grow in response to factors such as budget, or political decisions. 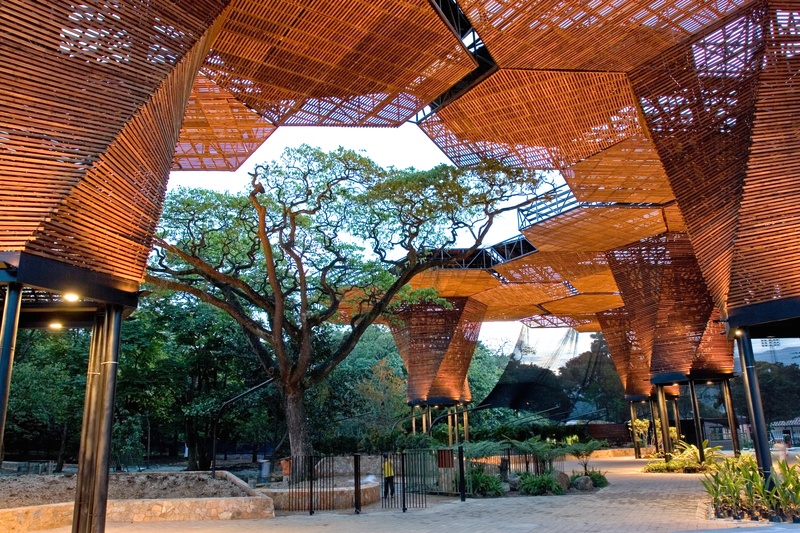 – hollow trunk structure defined by six metal columns which configure a patio and determine the position of the electrical and hydraulic networks. – structure of hollow metal beam petals. – re-collection of water: each petal is clad alternatively with transluscent policarbonate and opaque metallic tiles, which lead rainwater down the inner perimeter of the patio. 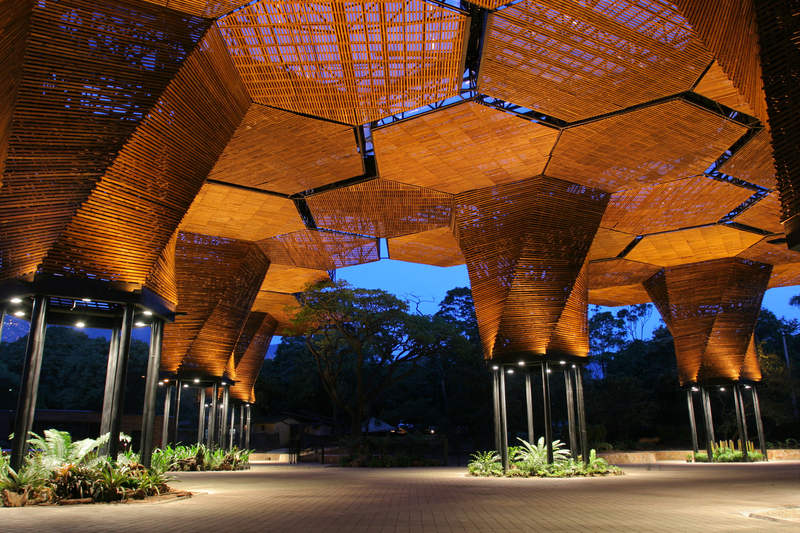 – hollow trunk cladding: the central hexagon of the tree-flower is clad with synthetic fabrics to protect the plants inside from rain and direct sunlight. – foliage, “fake sky”: harvested patula pine wood cladding strips creating a translucid effect. – ground: triangular concrete paving stones which help maintain the necessary humidity for the tropical plants. 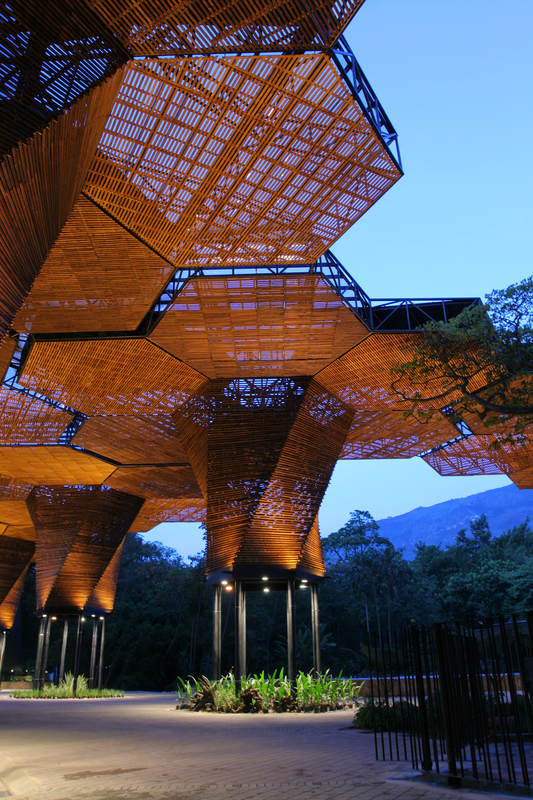 The result of these structures and their scale is the perception of being in the extension of a forest. 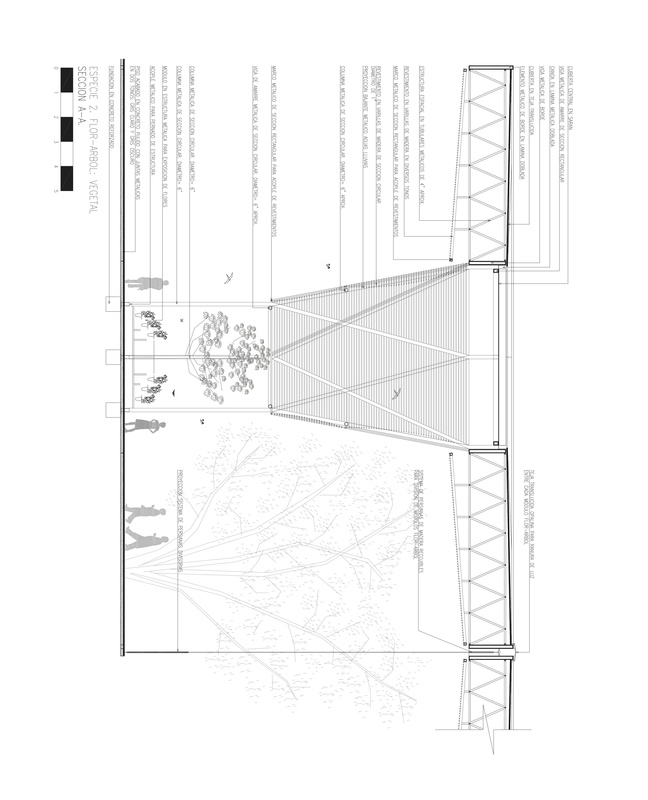 Drawings: Plan:b Arquitectos (Felipe Mesa + Alejandro Bernal) + JPRCR Arquitectos (Camilo Restrepo + JPaul Restrepo).